The unit is powered from a single PP3 battery. 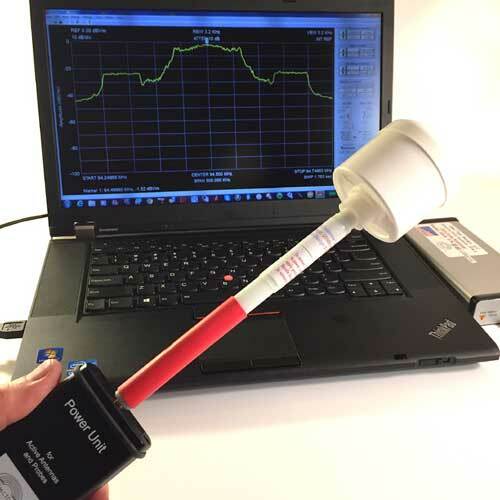 A green LED indicates that the antenna is active, a red LED indicates that the battery is low and should be recharged or replaced. 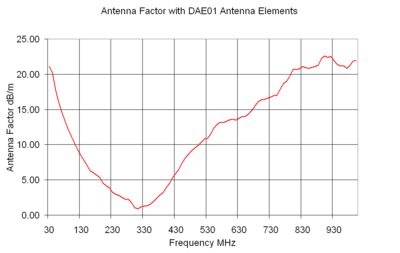 There is also an external DC option where the DC is supplied via the RF cable. 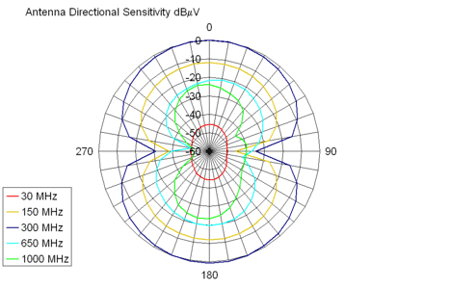 There are two sets of Dipole Antenna Elements (DAE) which can be used. The unit is supplied with one set as standard (DAE01). 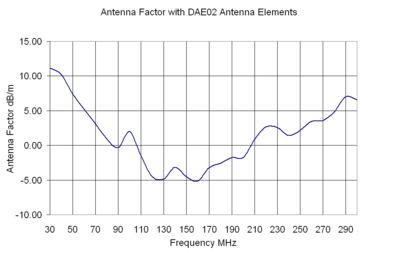 For higher sensitivity at the low frequencies DAE02 should be used. 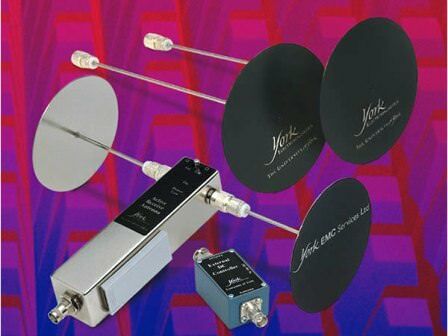 The Active Receive Antenna has been designed as a compact emissions antenna. The small size makes it particularly suitable for use in anechoic chambers, however it can also be used on an Open Area Test Site (OATS). 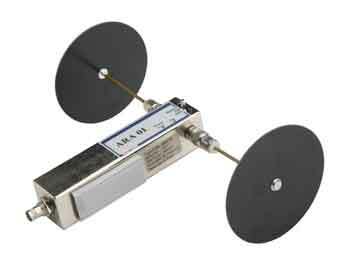 Antenna Unit (LxD) 9.0" x 2.25". Power Unit: (LxWxD) 3.75" x 2.25" x 1.25"
Rechargeable battery operation time: 10 hours. Warranty and Calibration Period - 1 year. 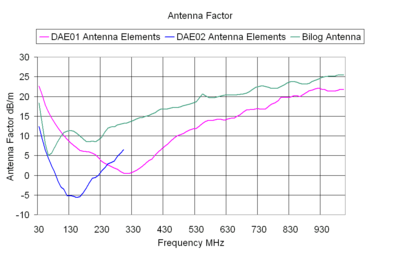 measured linearity, antenna factors (AF) and rotational isotropicity. Custom 5 ft. ferrite beaded RF cable. Table tripod with mounting clip. Rugged foam padded storage case. 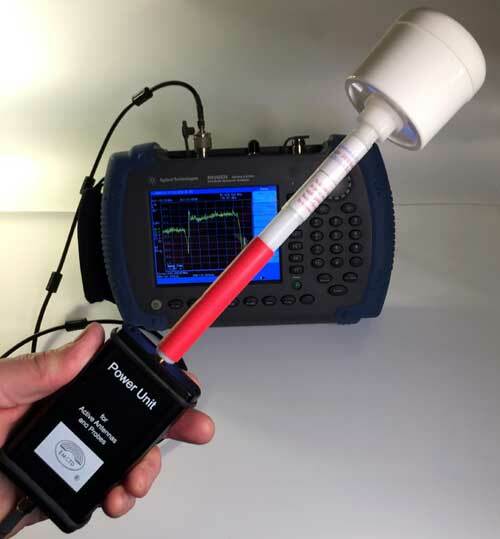 Omnifield Antenna® consists of three parts: antenna head, handle and power unit. Antenna head and handle comprise a single module while power unit is detachable from the handle to allow convenient storage in the supplied rugged plastic case. For normal operation handle must be connected to the power unit to provide power to the antenna head. Antenna head has 3 antennas positioned normal to each other. 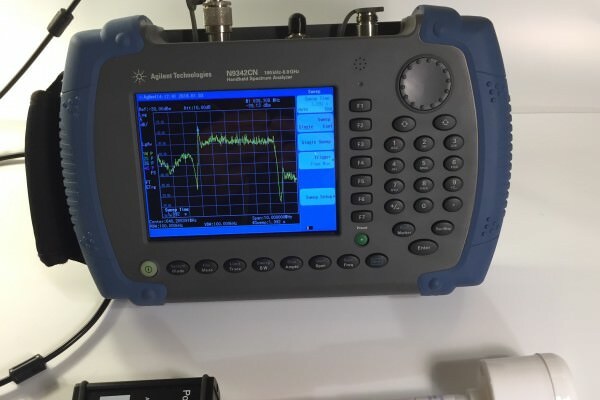 Signals from each antenna are combined and amplified to allow utput signal of Omnifield Antenna® to be proportional to the absolute value of the field regardless of the field direction. 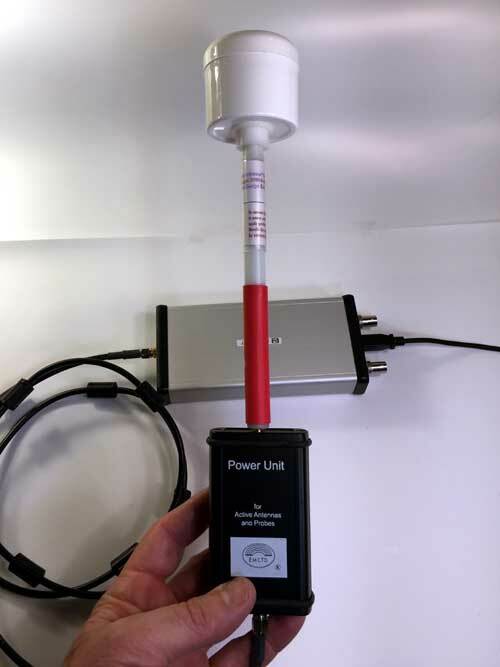 Power unit contains the rechargeable battery and connectors for the antenna and output cable. Ferrite beads, located on this cable, decouple the antenna from spectrum analyzer and reduce the effects of this analyzer on measured field. This cable also allows operator to have freedom to place the antenna in right position either on non-metal table tripod (supplied with every system) or onto optional 5 feet adjustable tripod. 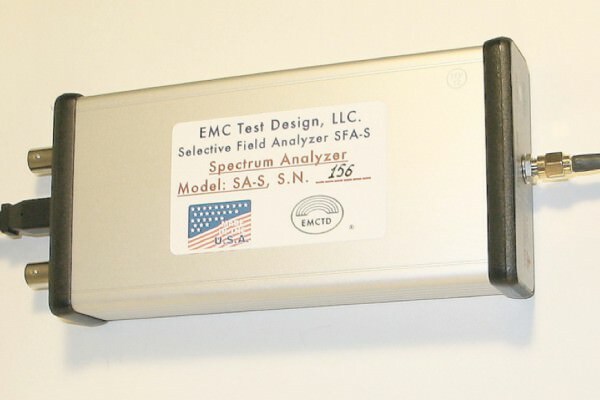 PC software for field strength measurements is standard.